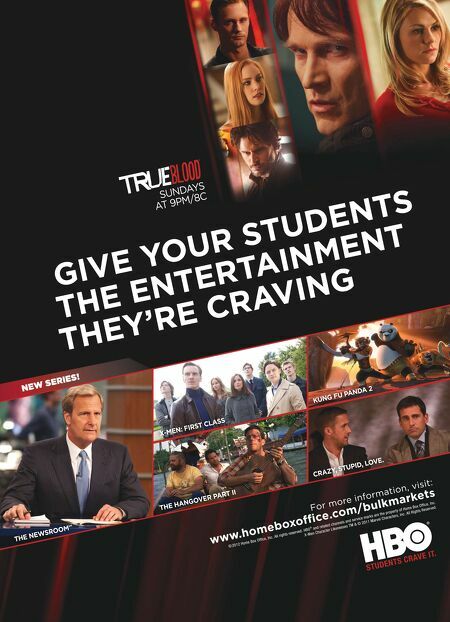 JUNE 2012 / COLLEGE PLANNING & MANAGEMENT 5 SUNDAYS AT 9PM/8C GIVE YOUR STUDENTS THE ENTERTAINMENT THEY'RE CRAVING NEW SERIES! X-MEN: FIRST CLASS KUNG FU PANDA 2 THE NEWSROOM SM THE HANGOVER PART II CRAZY, STUPID, LOVE. For more information, visit: www.homeboxoffi ce.com/bulkmarkets © 2012 Home Box Office, Inc. All rights reserved. HBO® and related channels and service marks are the property of Home Box Office, Inc. X-Men Character Likenesses TM & © 2011 Marvel Characters, Inc. All Rights Reserved. STUDENTS CRAVE IT.